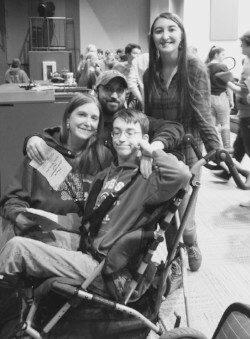 Carrie is mom to son, Jonas (age 16) who receives services at DSC, and Sydnie (age 17). When asked how raising Jonas for the last 16 years, along with husband, Chris, has positively affected their lives, Carrie shared her belief that they have an enhanced perspective on life and loving. She went on to explain that Jonas has limited communication, so Carrie and Chris have learned to love unconditionally and freely, as Jonas is unable to, “love us back” in the ways we are accustomed to giving and receiving love. She stated that the “little things” are a “big deal to our family such as Jonas sleeping through the night”, and they have learned to appreciate the good times. Due to Jonas’ disabilities, the family has not been able to enjoy some simple things, such as deciding to have dinner in a restaurant. So now, they feel grateful for an i-Pad as it offers some chance the family can do family things. This is a big deal. Parenting is hard work and it comes with many challenges mixed in among the blessings. For Carrie, some of the challenges she faces are the unknowns, sometimes just not knowing whether each day will be a good one or a bad one. Additionally, Jonas’ significant medical issues complicate these regular challenges. Jonas experiences severe seizures once a month making emergency room visits and/or the need for paramedics a regular occurrence. What all this means for Carrie and Chris is, “constant worry”. They find peace in knowing that, “God has everything under control”, but like so many moms, Carrie questions herself. She sometimes wonders, and really hopes that she has been able to give Sydnie everything she needs and deserves, as so often, Jonas’ needs take precedence.